So my first week of trying to learn, try, or do something new every day has been quite adventurous so far. It's been a challenge already, but also a lot of fun. Here's the recap of my first week. I learned where New Year's resolutions started and shared about that in my introductory post. Later in the evening, I was reading The Locust Effect by Gary Haugen. It's a pretty research intense book dealing with a lot of global issues, particularly the issue of violence against the poor. I came across a number of words I didn't know and looked them up: counterinsurgency, ad hoc, and opacity. Mind you, even though I wrote down the definitions, the next day all I could remember about counterinsurgency was guerrilla warfare. Ad hoc didn't stick. Opacity did. It's when something is opaque. I guess you can't say "opaquity". On this day, I was going to go sock shopping, and I thought it would be awesome to get toe socks. They were such a fad when I was a kid, but I've never had a pair. So I headed to Ardene, thinking that would be the sure store to find them. But they didn't have any. Neither did Marks or Wal-Mart. I learned that Wal-Mart continues to disappoint when I couldn't find some of the products I was looking for. 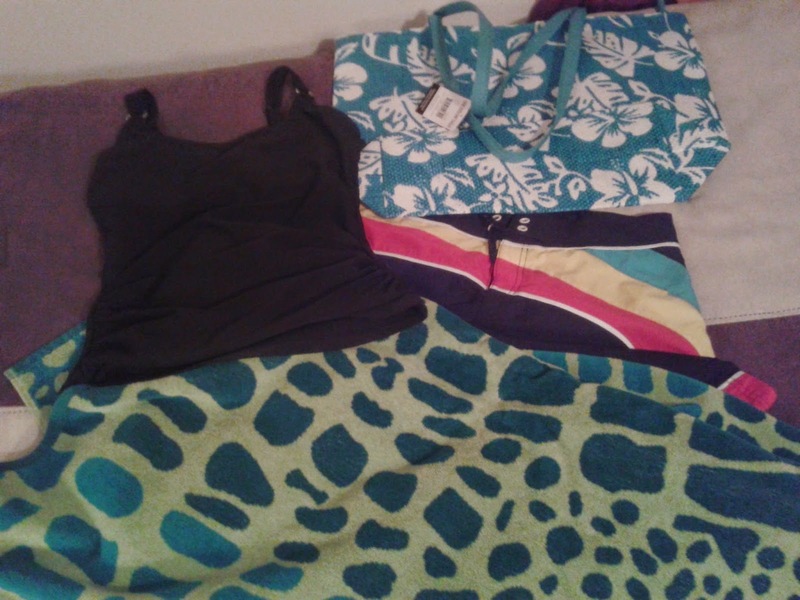 I also wanted a beach towel for my swim class and was really hoping for an Olaf or minion one. Yes, I think Olaf is like the cutest snowman ever and I'm also partial to minions for their cuteness. I'm convinced big eyes, over-sized heads, and cute voices and giggles sell, and not just to kids. The closest thing Wal-Mart had was an Angry Birds towel. I'm not a Star Wars fan. The Angry Birds one made it into my basket, but I ended up settling for a blue and green crocodile print one that was more adult sized instead. But I still had to do something new, and Day 2 was coming to an end. As I headed back into the mall and looked at Ardene passing by, my eye caught something. One of the things I wanted to try this year was going to a mall and trying on a bunch of fashions I despise. Go in and search out ugly. And now my eye caught it. (Please don't take offense at my fashion opinions. I'm rather conservative.) I picked up the article of clothing and headed for the fitting room. 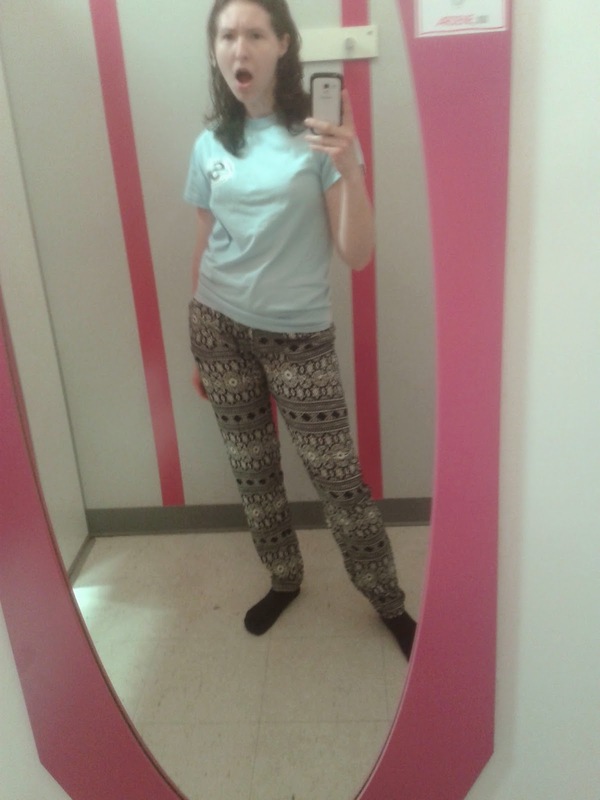 I chose to consider this my first fitting room selfie, since I still want to indulge in more of this activity. The tag said "THIS IS FOR YOU". No, it's really not. 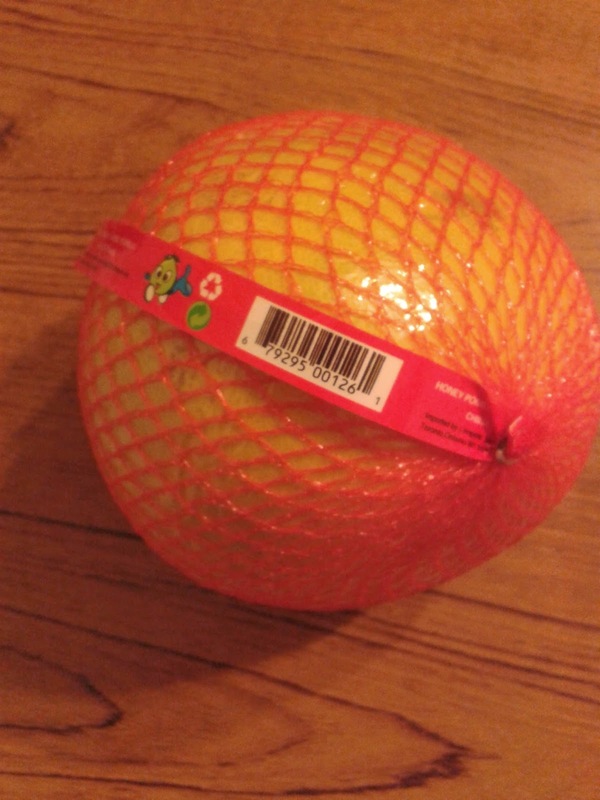 I tried a pomelo, which I bought the day before. I had never had one of these giant citrus fruits before. 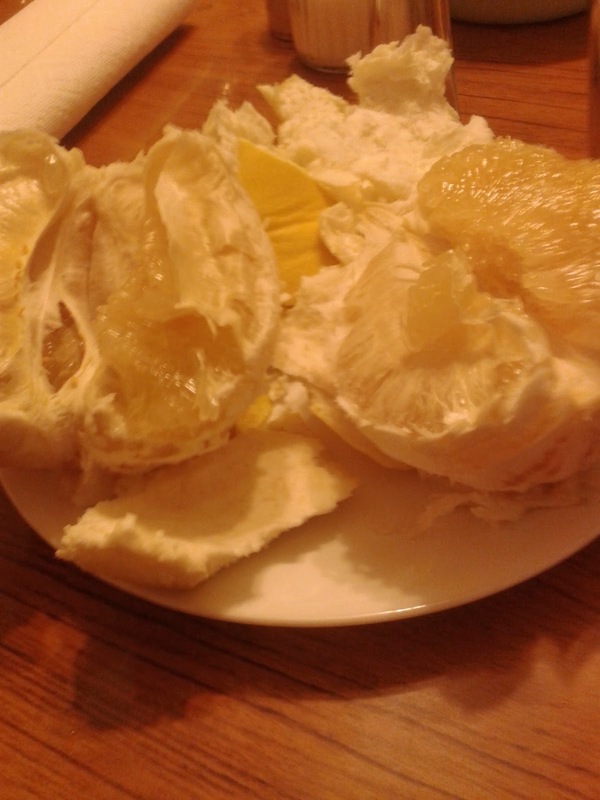 It's similar to a grapefruit and it's so big, I ate from it for days, with help. The hardest part is peeling the really thick skin. But they're good. I would get one again. This day was already a challenge with my schedule. I want to sleep a little later, go to church, then I had to go work right after church and only got home from work at 9:45pm. So what I did was, instead of reading my Bible as I usually would, I read the first verse of every book of the Bible and wrote down notes about what I learned. I did the Old Testament in the morning, and the New in the evening after work. I had to check the Table of Contents to make sure I didn't miss any, which was good, or else I would have missed Ruth. My notes are pretty long, so I will share them in a separate blog post later on. I also plan to do the same thing with the last verse of each book. It was a freezing, windy, blustery winter morning and I packed my beach bag. Oh yes, that was one cool thing I got at Wal-Mart, on sale for a buck! I started my first swim class on Monday. Swimming was an activity not encouraged when I was a child, but I've really wanted to learn for years. I can't swim yet, but I'm working on that. Since I'm the only one that registered for this class, I have one-on-one instruction. My instructor told me that your eyes don't actually burn from the chlorine in the pool water, but from the difference in pH. Tuesday was an unbelievable highlight and I was able to take a big one off my list, in a different way than I had anticipated. I turned 23 a week earlier and spent the day with an awesome friend. We've exchanged gifts for our birthdays for years. She told me I had take a rain check on my present, since it hadn't come yet. Hmm, what could she possibly be ordering that she was waiting to ship? Well, it arrived Monday and she wanted to get together as soon as possible to give it to me. She came over for supper and I made one of my favourite soups (see recipe here), and made cornbread for the first time. 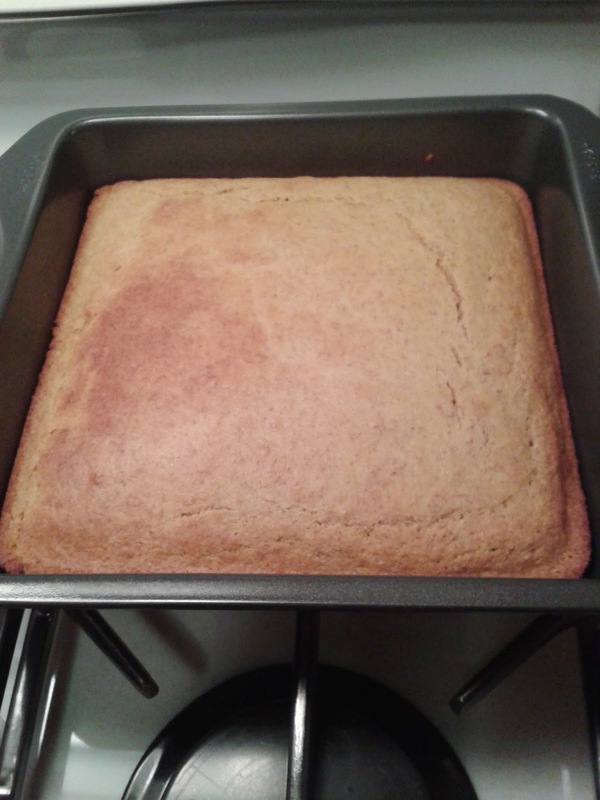 I'd had cornbread before, but never made it myself and had a recipe from a health book I wanted to try, which called for cornmeal and whole wheat flour, as opposed to white flour. A successful new recipe. It was good, but that isn't what I want you to get all excited about. This is what I want you to get excited about! 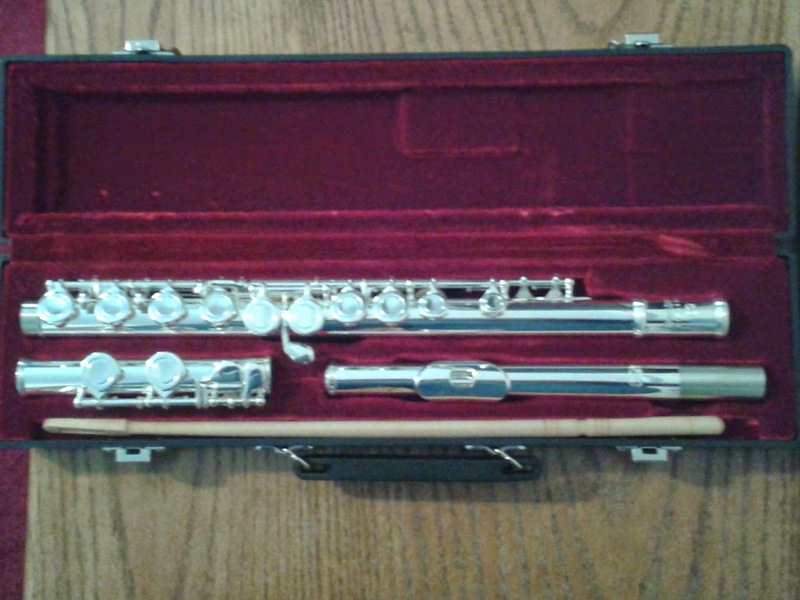 This shiny silver instrument is my very own Andreas Eastman flute! I had this feeling for a couple days that this was what my friend was getting me, but I wanted to be realistic and not be too hopeful. One look at the package wrapped in pretty pink paper told me I was right! I used to play the flute when I was in school, but was never able to get my own and I forgot how to play. It was amazing to put it together that night and play it for the first time. I kept a lot of my music from school, and I was surprised how quickly it came back, although I have a lot of practicing and re-learning to do before I can play like I once did. I took it a little more chill this day. I sat down for over half an hour in the morning and worked on learning to shuffle a deck of cards properly, which I could never do before. I'm still no pro at it, but I certainly improved. And I learned that after shuffling cards for half an hour straight, your fingers get sore, especially when you have dry winter skin to begin with. I also picked up my book The Locust Effect again. This time I learned about how corrupt the New York City police were in the 1890s, and the meaning of the word "pogrom," which is the organized murder of a lot of helpless people, typically for ethnic or religious reasons. Labels: Bible, books, cooking, food, music, pictures, What Did I Do?